My Favorite Things, Day 2: Huge Cookbook Giveaway! My Favorite Things, Day 3: Kindle Paperwhite Giveaway! I continue to make fudge every holiday season because it’s one of Shane’s favorites, right up there with chocolate truffle cookies on his “most requested” list. Nothing too fussy though – you won’t find nuts, dried fruit, or seasonal flavors like eggnog or pumpkin on the Shane-approved list 🙂 In the past I’ve made classic chocolate fudge and chocolate peanut butter, so this year it only seemed fitting to attempt a pure peanut butter version. Spoiler alert: this is seriously the easiest fudge ever! Four ingredients (that you probably already have in your pantry) plus a microwave: that’s all you need to make this fudge a reality! Oh, and total time investment? About 5-10 minutes of hands-on time – can’t beat that. For your effort you’ll be rewarded with a creamy fudge packed with peanut butter flavor. This stuff was so good it nearly made me a convert! It keeps for a week so it’s a good make-ahead option and would be a wonderful homemade gift this holiday season! PS – The second day of holiday giveaways is live! Head on over and enter here. Spray an 8×8-inch baking pan with nonstick cooking spray. Line the pan with parchment paper, leaving an overhang on opposite sides. Spray the parchment with cooking spray. Add the butter and peanut butter to a large microwave-safe bowl and cover the bowl with plastic wrap. Microwave for 2 minutes, then remove the bowl and stir the mixture. Re-cover the bowl and microwave for 2 more minutes. Transfer the bowl to your work surface and add the vanilla and confectioners’ sugar. Use a wooden spoon to stir the mixture until combined. You’ll know it’s ready when it becomes hard to stir and loses its sheen (do not overmix, or the fudge will be crumbly). Transfer the mixture to the prepared pan and spread in an even layer. Fold the parchment “handles” over the top of the fudge to cover. Refrigerate for about 2 hours, or until completely cool. Cut into squares for serving. Store the fudge in an airtight container at room temperature for one week. 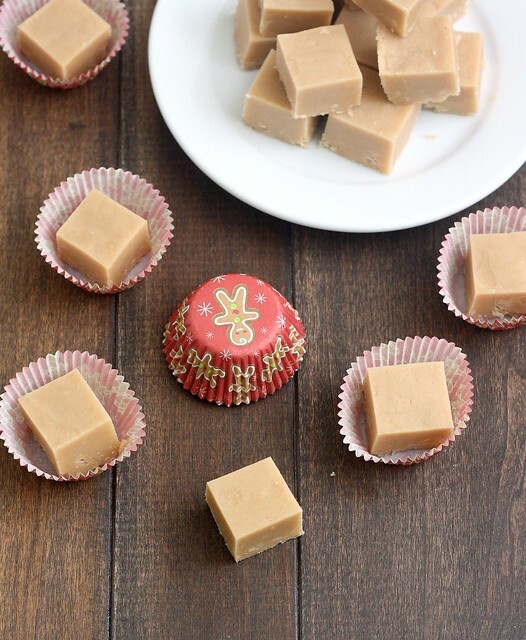 9 Responses to "4-Ingredient Peanut Butter Fudge"
This is too easy. Made this ages ago and it was gone in no time. Love it. 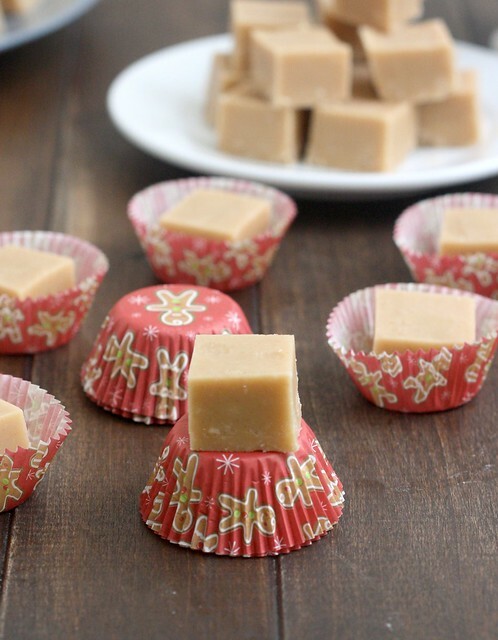 Thanks for reminding me of this one, I think…..
Peanut butter fudge is a must make in our family every year! Love how easy this variation is! That would be a great fudge for my kids to make! This is so pretty and is WAY too easy. 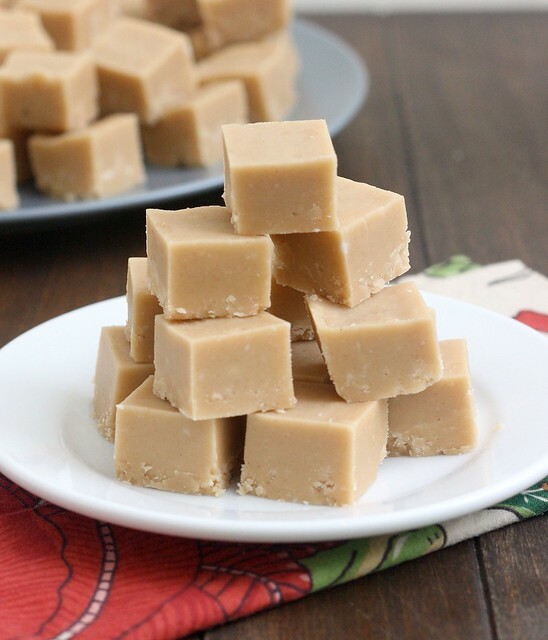 🙂 I love peanut butter anything, so I’m thinking this fudge is a must make. I think I made this ages ago for my brother! It was kind of amazing. The kind of fudge that is utterly craveable. My Dad used to make this every year! Wonderful Christmas memories!